The historic Hydro Majestic Hotel in the Blue Mountains started life as a hydrotherapy spa offering treatments like needle baths and bowel kneading. Today, it’s a resort that celebrates decadence – but ghosts reportedly still haunt its interior. The wooden planks creak and sink a little under our feet as we wander through the hotel. It’s no surprise – they’ve been trampled on for 113 years. The floorboards in the Hydro Majestic, in the New South Wales Blue Mountains, have never been replaced. Much of the hotel’s clientele is made up of repeat customers who return years – even decades – later, and like to remember where the creaks are. No one today would remember the hotel’s earliest days as a hydrotherapy spa, but many wax lyrical about its years as a weekend party venue for the Sydney elite. They enjoy its latest reincarnation, as a weekend mountain retreat, and feast on the memories. We’re standing in Cats Alley, a brightly coloured gallery that slopes uphill; the tough ironstone below was too hard to level. It’s a quirky, cosy space where the ladies once gathered to gossip. Peacock feathers line curtains, paintings of fierce hunting scenes line crimson walls, and velvet sofas are stuffed between lamps. On a late Saturday morning, it feels tranquil. A couple of ladies are sitting in some plush armchairs enjoying cups of tea, their backs to the window. They must be locals, because that window frames one of the true treasures of this place – a panoramic view of the forested Megalong Valley. The renovated Hydro Majestic Hotel. Even if you’ve never been inside the Hydro Majestic, you would have noticed its grand presence when travelling over the mountains. By car or by train, you whizz past its long, white buildings, with their resplendent dome and grand arches, which span a kilometre, atop a breathtaking escarpment at Medlow Bath. It seems to come from nowhere, but its exact position was carefully chosen by retailing magnate Mark Foy, who was determined that his hotel would have the train line, the highway and a magical view all within 100 metres. This remarkable cliff edge between Katoomba and Blackheath was the only feasible spot. Foy was driven by beauty, adventure and risk; the Hydro, poised on the edge of this stunning cliff face, embodies him perfectly. He was also a businessman with big ideas, and travelled extensively over the world to source fabrics for his family’s two successful Sydney drapery stores. During these voyages he became obsessed with the idea of recreating a palatial European hydrotherapy spa on top of a mountain back home. 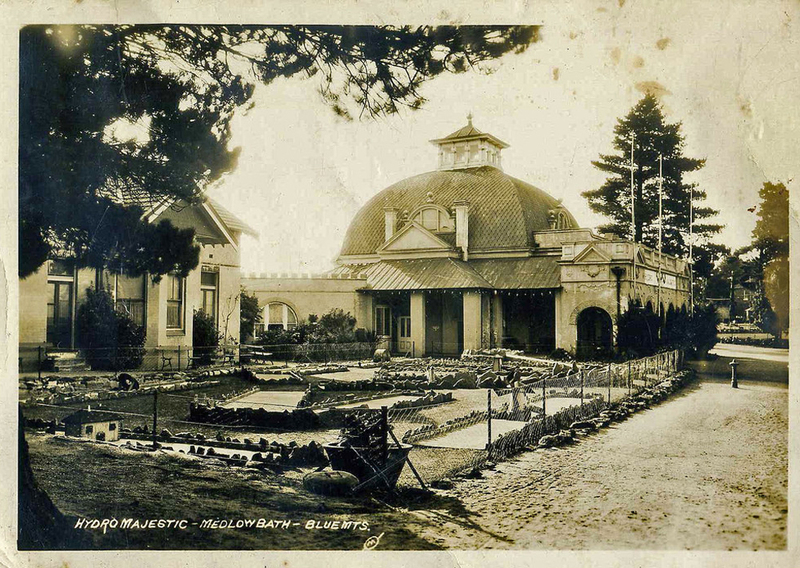 The spa at Medlow – he added the “Bath” bit later for promotional reasons – opened in 1904. It offered 83 treatments that included such delights as liver packs, ear douches, rain and needle baths, bowel kneading and electric rectal faradisation. The early excitement over the Hydro Majestic was not to last. The hydropathy fad quickly waned – or maybe the treatments were just not that enjoyable. Or perhaps a hydrotherapy spa on top of a dry mountain was never meant to be. In the end, the public didn’t want health. They wanted decadence. In 1906, the sanatorium was replaced by a luxury hotel that opened its doors to cigarettes and alcohol. Weekending Sydneysiders were right behind, and the Hydro Majestic became a party venue for the city elite. Since then it has been rejuvenated more than once. Following a fire in 1922, the hotel closed for several years before reopening as a more family-friendly and affordable resort. Over the decades to come, every effort was made to bring the Hydro forward, but the weight of its past held it down – upgrades were cripplingly expensive. The Foy family sold the Hydro in 1984 to Sydney lawyer John North, who sold it on to a Malaysian family in 1996. During this time, it became more rundown, its glory seemingly melting into the mountain below. The Escarpment Group bought the hotel in 2008, renovated extensively and reopened in 2014. It is now a contemporary offering, but its history has been lovingly preserved. Supposedly, ghosts still haunt its interior (one could be Australia’s first prime minister Sir Edmund Barton, who died from heart failure here in 1920). But the Hydro is perhaps most haunted by Foy himself. The businessman’s ideas, tastes and intentions possess every part of the hotel, from his mismatched styles, his obsession with mirrors (a perplexing chimney is made of them), his eerie paintings and the arches he so loved. The hotel is also frozen in time by government red tape. Some of its balconies stand forever empty because the railings aren’t high enough, but for the sake of history, must be preserved. Thankfully, the views of the valley can be enjoyed from almost everywhere in the hotel, particularly in the Wintergarden restaurant, which serves stunning high teas – both traditional and Asian – and beautiful dinners, with a strong focus on produce from the mountains and the NSW central tablelands. I enjoy a venison tartare with wasabi creme fraiche, black barley waffle, salted egg yolk and cumquat dressing followed by a half-baked brie with salted dulce de leche and baby figs for dessert. These days, the Hydro is a place to relax and splurge. Health seems to be confined to the tennis courts, which look sad and empty. Decadence is what the people chose, and decadence it continues to deliver. Late on Sunday afternoon I wander back past the tearoom and through Cats Alley. The glow of the lamps and the low, orange rays of the setting sun shine through wine glasses and onto the rich, red walls. The room is full of chatter and I think, romance. As guests wander past, the boards creak beneath the carpet. Reminding. Absorbing. Yesterday, hotel concierge Patrick Verity told us of a 95-year-old lady who recently went on his tour. She’d spoken of sitting and chatting here with her friends many decades before. And so the stories keep churning. Men can sit in Cats Alley, too, these days, but still I bet the subjects discussed aren’t so different. Those here this afternoon are probably enjoying a last moment of reflection before heading on home to Sydney. That itself is a form of therapy. And in this way, Foy’s original mission has been accomplished. Getting there: The Hydro Majestic is just under two hours from Sydney by car or by train. Staying and playing there: The Hydro offers rooms from $292 per night. But many visitors simply stop by to dine or take in the atmosphere. The Wintergarden serves high tea from $55 per person, and a children’s high tea from $35. Dinner is served from 6pm daily. More relaxed dining is available at The Boiler House Cafe, which is open for lunch Saturday and Sunday and public holidays. Two courses will set you back $55. History tours of the hotel cost $10 per person and run multiple times daily. * The writer was a guest of Escarpment Group.